Historical note The root word for orange is the Arabic, narandj (Sellar 1992). The orange is a symbol of innocence and fertility. Some scholars believe the 'golden apple' Paris presented to Venus was actually an orange. In return, Venus bestowed Helen on Paris as a reward for selecting her in a beauty contest, which eventually caused the Trojan War. The tree is indigenous to eastern Africa, Arabia and Syria and it is believed that the crusaders may have introduced the orange to Europe when they returned from the crusades. Unripe dried fruits and the fruit peel are incorporated into various products, including foods such as marmalade, alcoholic beverages such as Curacao and medicinal products. The essential oil is used in perfumes, cosmetics and aromatherapy (Leung & Foster 1 996), and also used as food flavouring and to disguise the unpleasant taste of medicines. Orange blossom water has been used for centuries in Mediterranean countries to flavour cakes and beverages (Jeannot et al 2005). 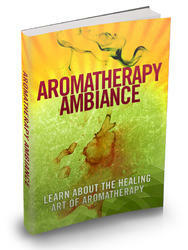 Aromatherapy, a word often associated with calm, sweet smelling and relaxing surroundings. Made famous for its mostly relaxing indulgent feature, using aromatherapy has also been known to be related to have medicinal qualities.